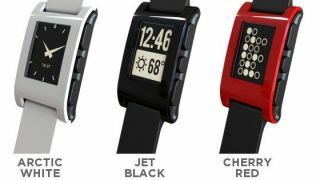 It's taken awhile for the Pebble Smartwatch to make the leap from Kickstarter darling to actual wristwatch wearers, but CEO Eric Migicovsky announced at CES 2013 Wednesday that time is finally upon us. The press conference was teased with an "it's time" tagline, and now we know that the e-paper watches are in mass production and Kickstarter backers can now place their orders for one to be shipped Jan. 23. That should make the 85,000 backers who helped grow Pebble's seed money to $10 million (around UK£6.5 million, AU$9.5 million) very happy. The Android and iOS syncing watch was supposed to start shipping in September 2012, but the company missed that deadline. It's now overcome whatever hurdles stood in the way and will sell the Pebble for US$150. Pebble is a chic-looking digital watch that lets users customize the clock interface and uses Bluetooth to send notifications for alerts like incoming calls, email, calendar alerts, Facebook messages, Tweets and even the weather. It will hook up with iPhones and iPod touches running iOS 5 or higher and Android 2.3 and up.